Since you have to check food temperatures for the health and safety of your customers, why not use the Comark waterproof digital thermometer to do so! 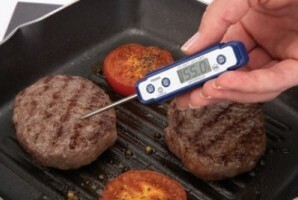 This digital thermometer comes with a 6 second response, is field calibrated and has a temperature range from -4F to 400F. Also comes with an auto power off, fits flat in your pocket when not in use and has a convenient data hold to freeze a reading for recording purposes.